The peanut-brittle leaves of the magnolia begin their annual departure, scattered here and there, they make a decisive crunch when stepped on. Blue Jay and yellow-beaked Magpie seem to make their homes here. They bounce along from lawn to stone to gather food for their evening meals. Melodies of joy and sadness echo from the treetops where they bathe in the warmth of a receding sun. 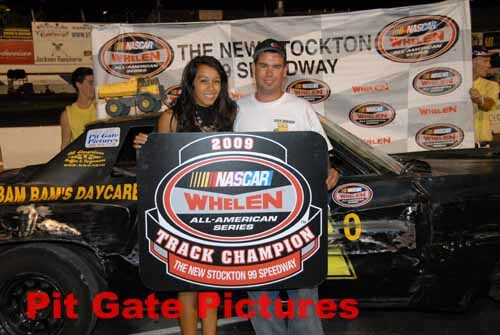 The Season has reached its final moments, and, on Saturday, September 26th, Stockton 99 Speedway Presented Fan Appreciation Night with the "Whelen All American Series Final Points Night" - Western Late Models 99 laps, Grand American Modified, ALSC/Street Stocks, Bombers, USAC Ford Focus Midgets. Double Track Points were on the line for all Divisions. It’s been a long year of racing here at the Speedway and the cumulative affect all boiled down to this Championship evening. The Championship in the Western Late Model Division was pretty much decided a month ago with 19 year old Justin Philpott, #05, of Tracy out of reach for the rest of the field which earned him the 2009 Western Late Model Crown. That certainly didn’t deter the racing from being anything less than fantastic over the last few weeks. And tonight would prove to be another night of great racing. The #30 of Ione’s Frank Farran nabbed P1 for this one with Escalon’s Sammy Solari (7), sliding out of his ALSC and into this new skin, flanked to the right. Solari got the holeshot coming off turn two and held tight until lap 10 when Farran spun between three and four which drew the first yellow of this 99 lap feature event. At the green, Michael Wendt (2) of Lodi got a tremendous restart and took complete control of the race as he chewed away at the asphalt and the laps until lap 82 when, much to Wendt’s dismay, the second yellow of the race went flying and erased what was a three-quarters of a lap lead. On the single-file restart, Wendt assumed his position on point as he once again took quick control and sped away to capture his first-ever Western Late Model Main Event Victory. “The car was fast tonight. I want to thank everyone on my crew,” said Wendt of this long awaited and well deserved win, “It’s about time!” Solari would hold on to finish second while Seaside’s Dave Byrd (86) made his way to third with Guy Guibor (61) of Manteca and Salida’s Mike Beeler (6) finishing fourth and fifth, respectively. 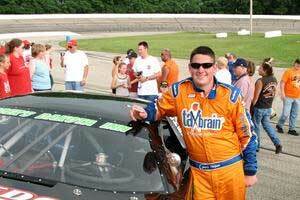 The Points Race has been very tight all year in the Grand American Modifieds, but with Scott Winters’ consistency throughout the season, he has definitely been the odds-on favorite to capture the 2009 Grand American Modified Championship, and tonight, that’s exactly what he did. Our favorite son, South Africa’s David Crouch (2) , with Stockton’s Larry Tankersley (96) at his side, brought the field around to greet the green in this 40 lap feature. Tankersley jumped out quick to take the lead, but was slowed on lap 9 when the #44 of Jeremy Jackson and the #24 of Scott Winters made contact coming off four and spun down the front stretch to the inside wall catching the attention of the flagman with yellow flag in hand. On the restart, Groveland’s Paul T. Henry (4a) grabbed a huge hunk of forward bite and with it came the point position which Henry took full advantage of as he never relinquished the lead and went untouched to victory lane. He did, however, have plenty of pressure from the #11a of Rick Anderson along the way, who in turn, had plenty of pressure from Winters. All-in-all, this was an absolutely great race. “The #11a car had me scared, okay! He’s fast, he qualified real well. I, on the other hand, didn’t,” said a very relieved Henry, “I wear glasses, okay, and when I hit the wall, they fell off and were bouncing around on my head, it was a heck of a scene. 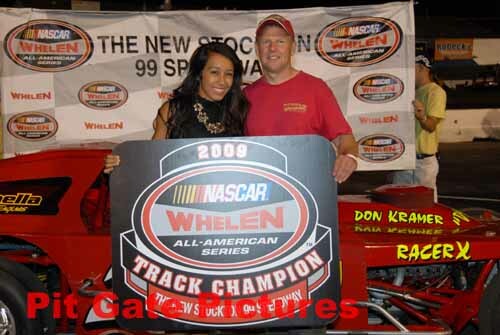 All I know is I’m real happy.” Anderson finished a strong second and Winters’ third place finish was enough to bring home the 2009 Grand American Modified Championship. “You know, this is an awesome place,” said the always gracious Winters, “You know, me as the driver, I have a ton of confidence because of the crew back here. They built this awesome car. This thing handles just perfect, even when it gets tore up a little bit, it’s still pretty fast. All our success this year goes to the crew.” The #1 of Todd Lynch and the #2x of Chris Smith rounded out the top five. The ALSC/Street Stocks have been an interesting Division this year. Packed with fierce competition and some of the best races to date, the Points Chase, over the last several weeks, boiled down to two drivers, Lodi’s #31, Jeff Ahl, leading the way most of the season, followed closely by Riverbank’s Aaron Coonfield. This one was supposed to come down to the final checkered flag, but due to an unfortunate altercation earlier in the day, Coonfield was asked to leave the premises handing the Championship to Ahl. Spencer Emerson (6) of Forest Hill started this one from the pole position with the #21 of Sacramento’s Kevin Owens at his side. Owens jumped out to the early lead which was short-lived when the #7 of Roseville’s Roy Smith and Stockton’s Ron McCaul (88) tangled high in turn four attracting the first yellow of the night on lap 3. On lap 9, the second yellow fell as Ahl got into the back of Emerson coming off two, sending Emerson to the tail-end of the longest line. On the restart, Owens opted to take the outside line which put the #99 of Stockton’s Donny Darter to his inside. Coming back around out of turn four, the two made contact and came to rest just below the flag stand. 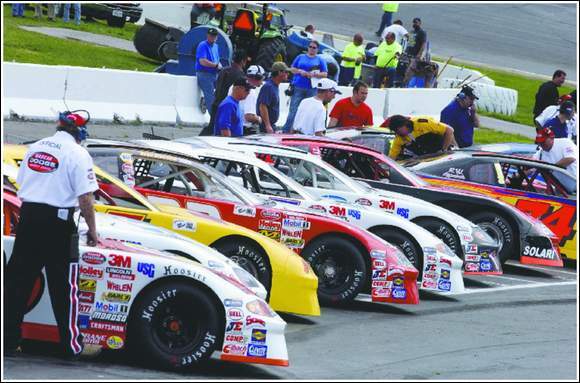 In the meantime, the entire field had stacked up behind them sending no less than ten cars to the pits for repairs out of which six never made it back to the racing surface. After the ensuing disagreement on the front stretch, where some blows were thrown, and after the carnage was removed and the red flag withdrawn, order was restored and the race got back underway. Brian Vosburg (89) of Stockton inherited the number one slot on the restart and from there he was on rails as he was virtually untouchable as he crossed beneath the checkers for his second victory on the season. “It took a lot of patience to work my way to the front, especially with that big pile-up,” said a very happy Vosburg, “When I saw that #31 car in my mirror, I was thinking, I hope he’s not hooked to hard to my bumper, because I’m taking him with me.” Ahl’s second place finish clinched the 2009 ALSC/Street Stock Championship. “This has been a long time coming, but I’ve finally done it,” said an elated Ahl, “I could tell you all night how happy I am and not ever run out of things to say.” Sam Solari (79) of Escalon finished third while Mickey Owens (08) of Elverta came home fourth with Sacramento’s Mike Dickson (76) rounding out the top five. On a side note: Stockton 99 Speedway would like to thank the All American Speedway Street Stock drivers for participating in our final race of the season. It was a pleasure to have you at our track. Please mark your calendars for the Fall Classic Open Show on November 6-8. 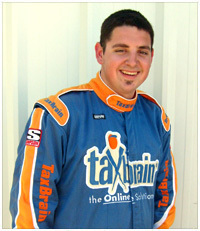 Ben Lewis II has had a stranglehold on the Points Lead all year long in the Bombers. Not needing to take the green flag tonight to capture the Title, he decided he was going to go out like a lion. This one got underway with Stockton’s Tom Dahl, behind the guise of a new skin in the #21 car, and the #33 of Stockton’s Brandon Jones pacing the field to green with Dahl grabbing the top spot until lap 7 when Fast Freddy Jr. (029) of Stockton came sliding out of turn four to an abrupt halt against the inside fence on the front stretch which brought with it the first yellow of the evening. On the restart, Dahl would once again gain command, but the race was slowed immediately on lap 8 as the #313 of Stockton’s Peggy Sue Jared and the #007 of Mike Massone tangled coming out of two drawing the second yellow which brought Jared’s night to an early end. The #21 took control on the restart, but on lap 12, Lewis had worked his way up from shotgun on the grid to roar by Dahl for the lead. From that point forward, Lewis showed the fans in the stands exactly why he is the 2009 Bombers Champion as he set sail, unmolested to the checkers, for his twelfth win on the year. “I owe this Championship to staying consistent all year long,” said the quiet-mannered Lewis, “Next year I’m moving up to the way faster ALSC Division.” Jones, in his rookie year of racing, held on to finish a very impressive second, and the only other car on the lead lap. Stockton’s Donna Dahl (4) took the reins from husband, Tom, and finished a solid third. Lisa Johnston (808) of Stockton brought her home fourth with Tom Dahl, rebounding from an earlier incident, finishing fifth. The USAC Ford Focus Midgets got underway with the #25 of Tim Skoglund and the #95 of Zach Stout on the front row with Skoglund jumping out front early on and holding strong until lap 19 when the #60 of Nick Carlson looped it coming off turn two which brought out the first caution of the race. Over the next several restarts, the race was marred by three more cautions until this one finally sorted itself out and some excellent racing took place. Skoglund was solid on point all night long until lap 38 when Carlson, miraculously rebounding from two earlier incidents, drove by for the lead and the eventual win. “My pit crew gave me a great car, and it was just so fast,” Carlson said politely, “I wanted to put my car wherever they weren’t, and it worked out great for us.” Skoglund finished an extremely close second while the #42 of Nick Romero was third. Stout fell back a bit to finish fourth with the #9 of Jessica Clark making up the top five. Next Saturday, October 3rd, the SRL SPEARS Southwest Tour Series will come rumbling back into town with the "Stranwold Properties 125”. Also on the bill for the event will be the Bombers, Basically-4-Cylinders and Figure 8's.